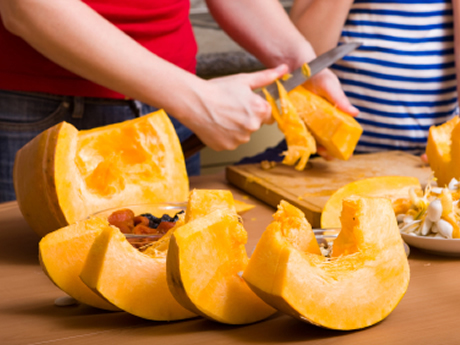 People who eat a lot of pumpkin, never have pain in the stomach, says old medicine. Although pumpkin is not the favorite food for all, its medicinal properties have undeniable importance and therefore pumpkin is called queen of autumn. In its composition pumpkin has high amount of antioxidants and carotene, especially vitamin C and E, and with its medicinal ingredients pumpkin is ideal for the fight against heart disease, risk of cancer, eye drapery and stroke. Its easily digestible “meat” contains few calories, eventually 28 to 100 grams. Quite the opposite to calorific poverty in yellow, orange fruit has a multitude of vitamins and minerals. Potassium as the most important nutrient for the heart, phosphorus and calcium, which together operate in building of bones and teeth, iron is important for your blood, and manganese which keeps skin and cartilage health. Folk medicine says that pumpkin does good to our body from the outside as well as from the inside. Fresh pumpkin puree is ideal as a face mask and in just ten minutes it cleans skin and constricts pores. It is ideal for acne prone skin, whiteheads and blackheads, so lately pumpkin emerges as a major component of problematic skin creams. Pumpkin will provide you many benefits, either consumed raw (graded like carrots), steam cooked or baked in the oven. Pumpkin calms anxiety and improves sleep thanks to B complex vitamins. Its fantastic nutritional profile complement pectin, cellulose and other important fiber for good digestion. This delicious fruit, due to the previously mentioned benefits is excellent for children. For those who do not consume pumpkin, the recommended solution comes in the shape of pumpkin. Besides gorgeous fun, seeds are an excellent source of protein, depending on the type of pumpkin, seeds contain up to 31 percent proteins. So a handful of pumpkin seeds satisfies the daily supply of amino acids, and by consuming pumpkin seeds we get omega-3 fatty acids good for the heart, vision and mood. Another product made by “Autumn Queen” attracts the attention of medics and gourmands, and that is pumpkin oil containing a large percentage of beta carotene, vitamin E and potassium. Only one spoon of pumpkin oil is enough for a fantastic taste of the salad.